You will notice that I've added a little Amazon widget to the sidebar on the right. I've been wanting to do that for a while but never actually explored it until the other day. It's actually very easy to do. And instead of making it a collection of my favorite books, I've got it displaying the books I'm currently reading. As for my favorites, we'll continue to take a look at some of those each Thursday. When I first mentioned the idea of a weekly post sharing some good books, I mentioned that I'll be picking books off my "Jacob's Ladder" bookshelf and, indeed, I do have it set up like a ladder. The easier or more earthly books (sports, mainly) are on the bottom and things get heavier as we move upwards (from basic religion/science/history up to deeper physics/spiritual/philosophy stuff) culminating in the top shelf which houses a whole collection of Joseph Campbell books as well as some of Carl Jung's best stuff, Nietzsche, and Goethe. Today we're up at the top shelf. And the book I've chosen is probably the only book by Campbell that I've read more than twice. 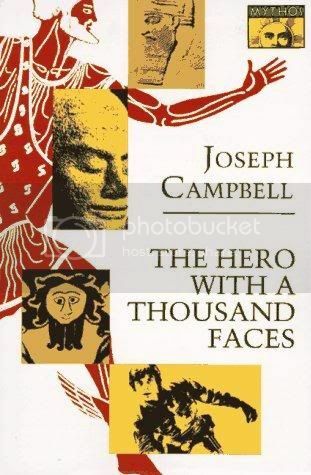 It's his first book (well, the first book he wrote on his own) and it remains his most famous work: The Hero with a Thousand Faces. While it is basically an introduction to the material that he would expand on all throughout his career, it is one of his most accessible books and thus, perhaps, the most rewarding. It continues to be a major influence on people, especially artists and, most famously, it was the major inspiration for George Lucas' Star Wars films. What, now, is the result of the miraculous passage and return? After explaining each stage for us, using elements from a ridiculous amount of different myths along the way (Buddha, Jesus, Eskimo stories, Native American myths, African tribal rituals, Greek myths, everything), Campbell then explores the source of it all, the unconscious mind from which these rich stories spring forth, and what it all means psychologically and cosmically. He discusses the "universal doctrine" found in the cosmologies of every culture throughout human history that "teaches that all the visible structures of the world---all things and beings---are the effects of a ubiquitous power out of which they rise, which supports and fills them during the period of their manifestation, and back into which they must ultimately dissolve. This is the power known to science as energy, to the Melanesians as mana, to the Sioux Indians as wakonda, the Hindus as shakti, and the Christians as the power of God...And its manifestation in the cosmos is the structure and flux of the universe itself." But to apprehend the very source of this energy, one must transcend the human organs of apprehension because the forms and categories of our rational minds are, themselves, manifestations of this power and thus preventing one from being able "not only to see, but even to conceive, beyond the colorful, fluid, infinitely various and bewildering phenomenal spectacle." And so the function of myth is to help the mind achieve that "jump" beyond the phenomenal. As Campbell says, "Myth is but the penultimate; the ultimate is openness...into which the mind must plunge alone and be dissolved." The elements of myth are meant to attract the mind towards what is beyond these elements, the infinite eternal void out of which our categories of opposites and duality spring. "Therefore, God and the gods are only convenient means---themselves of the nature of the world of names and forms, though eloquent of, and ultimately conducive to, the ineffable. They are mere symbols to move and awaken the mind, and to call it past themselves." This was the first book by Campbell that I ever read and, though I think there are others that are actually better, it is the book I come back to the most. Especially in times like right now where I'm traveling rather aimlessly on an unfamiliar road that I hope leads to a creative future. This book was my bible when I initially left the nest at age 22 and traveled across the US to San Diego with no practical plans. Three years later, I'm still on the journey and maybe only slightly less confused. This is still one of the first books I turn to for answers.